Great to see, thanks for the link. It's great to see a "chicken coop" come back to life. Congratulations to all involved! Where did you find the truck and electrical equipment for it? Lyons Industries of Ebensburg, PA did the truck work. ACE Electric of Bangor, Maine did the motor work on the ancient GE-800 motors. Lyons did a good job, stretching the wheelbase to 8-feet, replacing the axles, wheels, gears/pinions and most of the steel and cast iron castings. It's probably 90% new. Thanks for the info. It sure is a nice looking car! If the truck is 90% new why bother with the rebuild? A historic artifact was destroyed for no reason. Its value as an historic artifact was limited to static display, in a seriously degraded state. Unless there is great value in keeping the contents of a museum's 'Rotten Row' as they are, then replacing unusable material to return it to operation is a good choice. It made it possible for a 'chicken coop' to run again, so that's good enough for me. 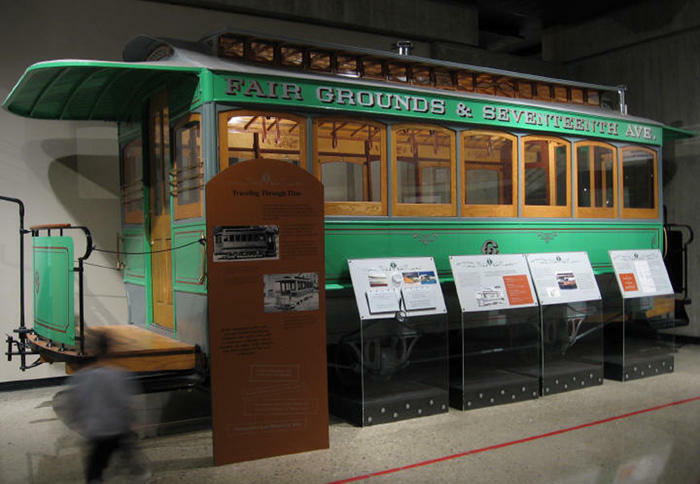 The real tragedy is that the truck and motors came from a Lancaster, Ohio streetcar that began life as a horsecar. It was a very early conversion to electric power, as evidenced by the trucks, motors, and controllers. This car ended up in the collection at the Ohio Historical Society in Columbus, who decided to "restore" the car back to a horsecar, which involved creation of many new parts. While the car looks nice, I doubt there isn't much historic fabric left in it. Absent being displayed on the car it ran with, I'm glad MSM was able to find a good use for it, as it closely duplicates the original St. Louis truck under the car. On a side note, the OHS allegedly has a second Lancaster car in its collection, an open car. It is not on display. Has anyone seen it? Is it this car? I visited OHS and saw the Lancaster open car in storage. It was packed in with other objects and my photos did not show much detail. I recall it looked like most vintage cars that are tucked away in other museum collections. I remember the Lancaster cars were a "barn find", weren't they? I am thinking they appeared in a news item somewhere 15 years ago. Where was it? Here on RYPN? I recall reading somewhere that the Lancaster, Ohio open car was also a single truck car. It's a shame that the car in the photo isn't restored and running. It's pretty cool. As Brother David said, probably not much original fabric there. This link includes a link to a rather poor image of the stored open car. Attached is the Ohio History Center’s data card for the open car. Larry, thanks for posting the catalog sheet for Lancaster 3. I hadn't seen that before and it's pretty interesting. I thought the open car was built in 1882 but the sheet implies it was 1888; I wonder if there's any way to know for sure. I'm also curious about the car's control and motors. If memory serves the car that was rebuilt/backdated to a horsecar had Type E controllers (predecessor to the Type K controller) which I believe are the only existing examples of that type - with the possible exception of car 3 (?). To respond to the earlier message, I believe a photo of the two Lancaster OH single-truckers, as barn finds, was included in an early L&RP publication. Sorry I no longer have a collection to do the research.